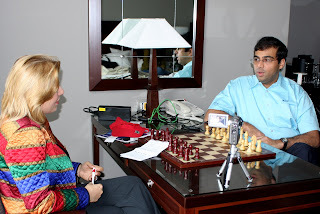 This picture is Susan Polgar with Vishwanathan Arnand. Susan is the first woman grandmaster in history and former Woman World Champion. Vishy is the current World Champion. I am proud to work for Susan on her Chess Discussion Forum. I help her manage the site as a Moderator. I also help manage the site ChessUSA for Steve Owens.